Measurements: 1.21 m diameter by 1.10 m height in the vessel. Name: this one is used to sound the nine o’clock chimes to call the Canons to the daily prayer of Laudes, which is held at half past nine. Smelting year: 1609 by Juan de Villanueva. Measurements: 0.50 m diameter by 0.60 m height in the vessel. Name: “Cimbalillo”, or “little bell” given its small size and stretched shape. 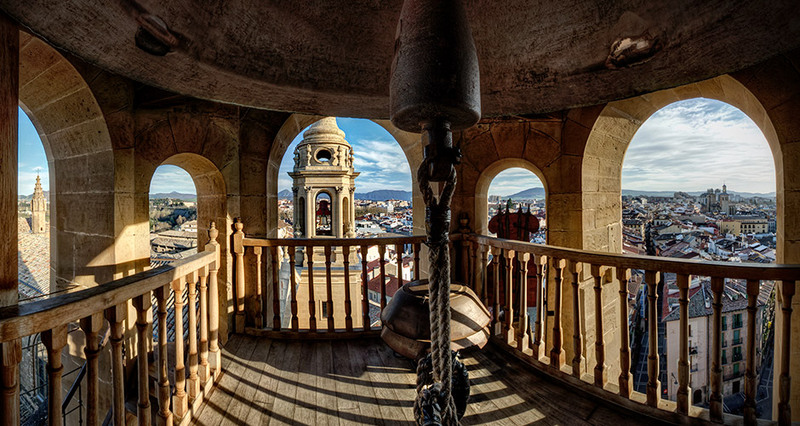 Use: this bell is used to start the chiming of the other bells in the towers. This is why, differently to the other bells, its cord extended outside the tower to a window of the bell-ringer’s house from where the main altar could be seen. Smelting year: 1609 probably also by Juan de Villanueva. Measurements: 1.30 m diameter by 1.25 m height in the vessel. Name: from the invocation to Saint John the Baptist which it features in an engraving in Latin: “Saint John the Baptist, pray for us”. Smelting year: 1792 by José Marcout. Measurements: 0.80 m diameter by 0.80 m height in the vessel. Name: surely due to its whiter original colour. Use: it was used, along with the Infants’ bell (Párvulos) when a child died before the use of reason. Measurements: 1.50 m diameter by 1.30 m height in the vessel. Name: due to its daily use. Use: it was used to call to prayers on working days, Sundays and minor festivities. Smelting year: 1802 by Bernardo de Mendoza based on another bell that cracked. Measurements: 1.67 m diameter by 1.35 m height in the vessel. Name: it gets its name from the Archangel Saint Gabriel, whose Incarnation message is engraved in Latin on the bell itself. Use: it is currently cracked. It probably cracked during a celebration that lasted for hours in the evening in the 19th to 20th century. Measurements: 0.80 m diameter by 0.75 m height in the vessel. Name: given due to its particular use. Use: used along with the silver bell when a child died. Measurements: 0.51 m diameter by 0.59 m height in the vessel. Name: from the invocation to Saint Bárbara which it features in an engraving in Latin. Use: when there was a storm. Saint Bárbara is, according to tradition, the protecting Saint in storms. 17. Capilla Barbazana18. Refectorio19. Cocina20. Antigua residencia episcopal21. Campanas torre norte22.